I made this card and the whole time I was remembering one of our Christmas in Germany where my family on Christmas Eve visited the little church, St. Nicholas Church in the small village of Oberndorf, Austria. On December 24, 1818 the Christmas hymn Silent Night was sung in this church for the first time. And now this song is sung in 135 different languages and has over 200 different versions. 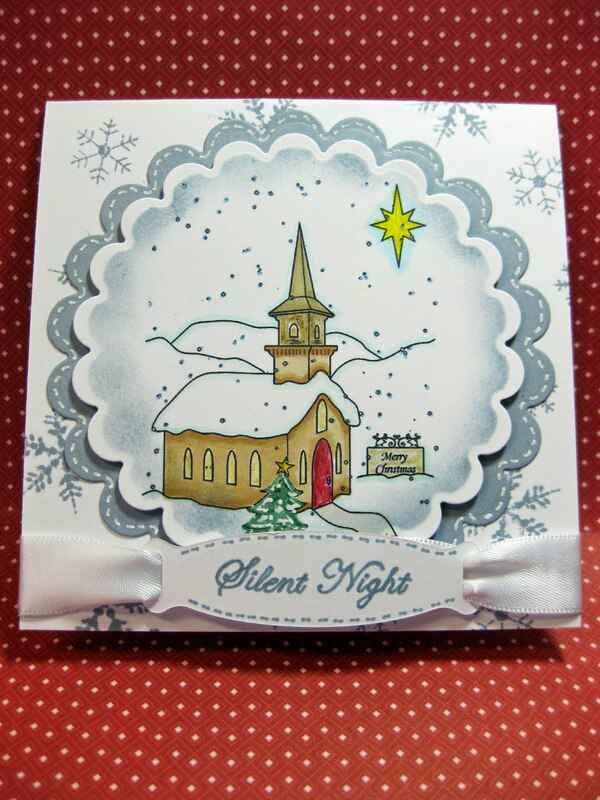 This beautiful stamp reminds me so much of the little church where Silent Night was sung for the first time. And all the wonderful memories of those snowy, cold Christmas that we spent in the beautiful country of Germany. This stamp is designed by Julie of Jules Junk. She is one of the stamp creators of the Digital-Ink Co. Her stamps are fabulous and like I keep saying their prices are the best. So........Please visit the shop and see all the designers creations. If you haven't been there please head on over to the Digital-Ink Co Challenge Blog and take a look at all the other design teams creations for this challenge. There are some fabulous prizes for some participates of this challenge so please get out your paper, markers and bling and play along with us. You are one talented lady!! This is such a gorgeous card!! I love everything about it and your story is precious. Thank you for doing such a beautiful job! Beautiful card Harriet. Glad to have you on the Design Team. What a gorgeous card Harriet. Love the colors you used and I enjoyed reading about your Christmas memory. Harriet--this card is absolutely breath-taking--so very elegant! I know Jules loves it! Oh Harriet, one of my favorites "Silent Night"..that song almost brings tears to my eyes every year...that and of course Silver Bells lol...Your card is just beautiful..thank you again for being on the team.. 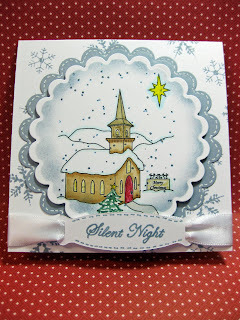 I just adore your Silent Night card. I couldn't wait to see this one finished, and you did is so very beautifully! Hi Harriet, this card is absolutely beautiful!! The story is so precious. Wow, this song has a whole different meaning for you. How cool was that to have visited that church. That is a beautiful song and your card does it justice! Great job girl!! Harriet, your card is beautfiul! Love how you did the ribbon! Totally gorgeous Harriet. Truly beautiful. I love the card and the story behind it. So touching! Win some fabulous Digital images ?????? ?